Biskit/Mod is a python module for fully automatic or semi/automatic homology modelling. The pipeline works fully automatic but the different steps are as much as possible decoupled. This allows you to intervene manually in between the steps. For example, you can first manually change the template selection, repeat alignment and modeling, then optimize the alignment, and repeat only the modeling step. contains for each template, their PDB code, the all atom rmsd (rmsd_aa) without iterative fitting, the c-alpha only rmsd (rmsd_ca) without iterative fitting, the rmsd_aa with the percentage of outliers during the iterative superposition, the rmsd_ca with the percentage of outliers also. Following the percentage of identities (mean) of the target with its templates and finally the number of templates which served to remodel each template. contains for each residue of the target the rmsd profile given by each template using the multiple alignment. Then, a score, which is the mean rmsd. This score serves as final evaluation for the models of our target. PDBs files with the rmsd score from cross-validation put into the B-factor column. The user could visualize easily the result with a classic software as VMD or Pymol using a gradient of color for this score. Put a file with the target sequence into an empty directory. -psi    use PSI Blast instead, experimental!! You can edit the search result by removing (or adding) sequences from nr.fasta. -psi    use PSI Blast instead, experimental (currently not working)!! 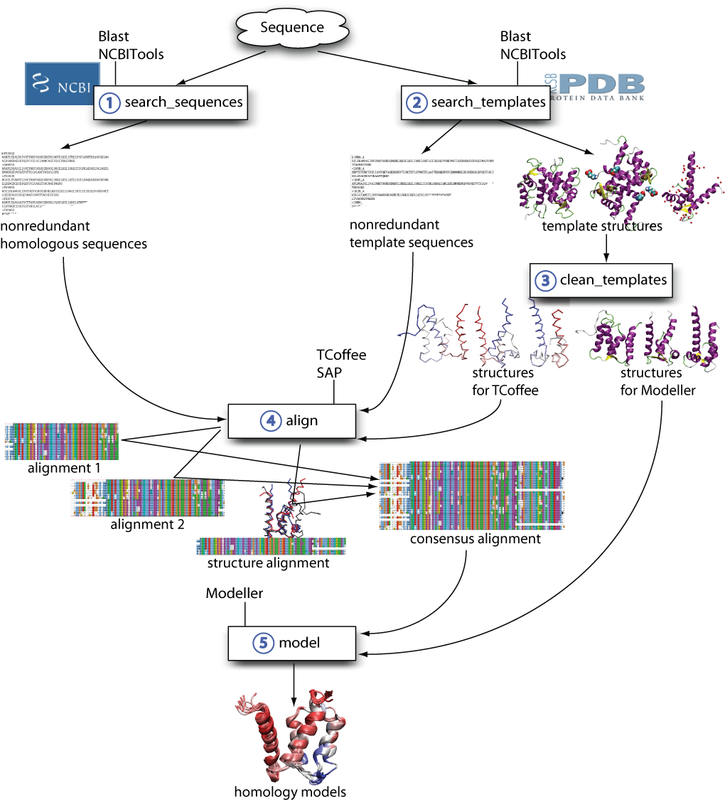 templates/all/: directory with all homologous structures (PDB format). templates/nr/: directory with the non-redundant template PDBs. templates/nr/chain_index.txt: the PDBs (plus chain IDs) which will be cleaned for modeller and T-Coffee in the next step. Edit chain_index.txt and templates.fasta to remove or add templates or force using different chains. If adding templates, make sure the new entry in chain_index.txt points to an existing file (best put into templates/nr/). This step prepares the PDB files in the directory templates/nr for the multiple alignement step (T-Coffee) and the building of the models (Modeller). This step creates a new homology modelling project for each template structure. The aim is to re-model all known template structures (pretending we don't know their structure). setup_validation.py links in the cleaned structures from the previous steps. Build multiple alignments with T-Coffee. (A) one-by-one with by running align.py in the project folder and in each single cross-validation sub-folder. OR (B) by running the parallised align_parallel.py in the project folder. -> must be accessible w/o password via ssh, check! If there are more than approximately 50 sequences t_coffe will eat up all the memory and the job will not finish. (This is taken care of by Aligner.py). This should be fixed in more recent versions of T-Coffee (v > 3.2) where T-Coffee, according to the manual "switches to a heuristic mode, named DPA, where DPA stands for Double Progressive Alignment." If there is only one template structure, step 2 of T-coffee will not work. Skipp the structural alignment if only one template structure is provided! In quite some cases the sequence retrieved from the nr PDB sequence database is different from the sequence extracted from the coordinates in the pdb-file. This will sometimes cause t-coffee to terminate with an error (2 sequences with the same name but with different sequences). Temporary solution: Choose another structure from the same cluster as the troublemaker. t_coffee/final.pir_aln: Alignment in pir format. For more details, see the T-Coffee documentation. You can edit final.pir_aln before running the model-building step. As before, the Modeller step can be run in two different ways: (A) Either one-by-one non-parallel (model.py) or (B) parallelised (model_parallel.py). modeller/target.B999900? ?.pdb: raw output PDB files, 10 models by default. modeller/Modeller_Score.out: all the modeller scores (Objective Function) for each model (in increasing order). modeller/model_? ?.pdb: output PDB files (10 by default) ordered by their modeller score. modeller/PDBModels.list: pickled python object (ModelList) with same PDBs as PDBModel objects (in same order). identities_cov.out: percent identity of sequences between target and the different templates (directly in the project folder). The first evaluation step is to determine how well we can reproduce a template structure by modeling them from the remaining templates. As the structure of each template is available we can then compare them with the dummy structures that we produce using Biskit/Mod. validation/????/benchmark/Fitted_? 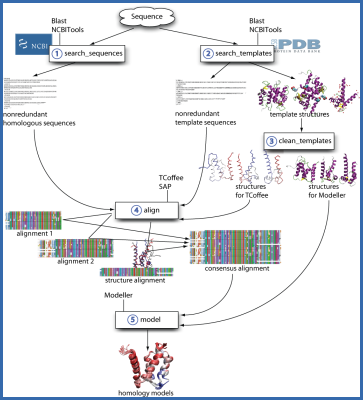 ?.pdb: Each dummy model superimposed on its known structure. The fitted structure is called fitted_00.pdb refering to the dummy model number 00 etc. Currently, the iterative superimposition method implemented in biskit/Biskit/rmsFit.py is used (max. 10 iterations). validation/??? ?/benchmark/rmsd_aa.out: gives the all-atom rmsd of the different dummy models. (1) without iterative fitting, (2) with iterative fitting and (3) the percentage of atoms that has been removed during the iterative fitting. validation/????/benchmark/rmsd_res_?? : gives the C-alpha rmsd for each residue in the current dummy model. validation/??? ?/benchmark/PDBModels.list: pickled PYTHON list of PDBModels. Same as modeller/PDBModels.list but now each model contains the benchmark information in the atom and residue profiles: 'rmsd_aa', 'rmsd_ca', 'rmsd_res'. See PDBModel.profile()! analyse/global_results.out: for each template, PDB code, the heavy atom rmsd(rmsd_aa) with and without iterative fitting, the C-alpha rmsd (rmsd_ca) with and without iterative fitting, the rmsd_aa with the percentage of outliers during the iterative fit, Moreover, the percentage of identities (mean) of the target with its templates, the best Modeller score and finally the number of templates which served to remodel each template. analyse/local_results.out: contains for each residue of the target the rmsd profile given by each template using the multiple alignment. Then, a score, which is the mean rmsd. This score will served as final evaluation for the models of our target. modeller/final.pdb: the "best" model where the B-factor (Temperature factor) are replaced by the score rmsd for visualisation, e.g., in VMD or Pymol. Michael Nilges worked out the alignment and modelling strategy (including T-Coffee parameters, Modeller input scripts etc). R.G. & J.L. translated this strategy into the Biskit/Mod package and tested/bugfixed it all to full automation (well, more or less). David Giganti bravely used Biskit/Mod for the first real-world application and had the idea of re-modelling the template structures for cross-validation. Olivier Perin spent his very productive internship on implementing the cross-validation in Biskit/Mod and parallelising some of the steps (supervised by R.G. ).